Henry Stanhope Badcock founded the W.S. Badcock Corporation in 1904. An immigrant from England, Henry founded the first Badcock store in Mulberry, FL. Henry operated this single store in Mulberry, FL for 16 years until, in 1920, his son Wogan bought the store from his father. Business continued to grow until the land boom/bust of 1929. The depression hit the country hard, and Badcock was no exception. Finding it increasingly difficult to sell the merchandise he had on hand, Wogan began to sell merchandise through consignment at various stores in the area, offering a share of the profits if they sold the merchandise. Wogan also established the idea of the route salesman, who would use small trucks, travelling designated routes, to sell the Badcock merchandise. This laid the groundwork for the dealer model, which is still the foundation of Badcock’s business model. At the same time, Wogan introduced the practice of selling furniture to customers on credit, and collecting on installment accounts from these customers. Over the years, this consignment model and route sales evolved into the dealer operation that is still active today. These home-furnishing centers would receive and sell merchandise only from Badcock, and these dealers were able to finance their customer accounts with help from the W.S. Badcock Corporation. The principal of easy, fair credit was a novel concept at the time, and Wogan Badcock was a forerunner of the way that most merchandise transactions are handled today. "My own experience was delightful - but only a few months ago - I was in the process of getting a homeless veteran settled into a new place and I went to Badcock to get him a few items to set up house - they were so nice and once I explained I was helping with a veteran - they even donated a couch to him!!! With a business that supports our veterans - is a business that I will support and send all my friends family and colleagues..... AND OF COURSE VETERANS! Thank you for all you do for our community"
In 1963, Wogan's son, Wogan Stanhope Badcock Jr., at the age of 31, assumed the position of President of the W.S. Badcock Corporation. Four years later, the Corporation expanded outside of the state of Florida, opening a store location in Valdosta, GA. From 1969 to 1976, the W.S. Badcock Corporation opened 150 home furnishing locations, with the 150th location opening in Graceville, Florida. In the 1980's, growth continued with over 175 stores producing annual sales upwards of $100 million. As the store count continued to grow, so did the Badcock footprint. 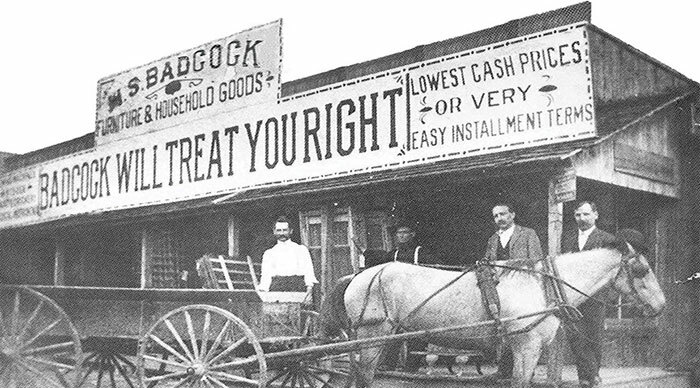 Badcock opened stores in South Carolina, North Carolina, Mississippi, and Tennessee. In late 1999, the corporate image "and more" took on a whole new look and design. The traditional blue and orange logo of the 1960's was replaced with the logo that stands today. Badcock also launched the “Store 2000 Conversion Project”, which featured new storefronts and a more customer friendly, open-layout interior redesign. On March 7, 2000, the first Badcock &more retail store built from the ground up celebrated its ribbon cutting in Dade City, Florida. In 2013, Badcock &more began working on the next refresh of stores, featuring new floor plans, interior colors, and a sleek new identity wall. Badcock still offers our affordable, easy credit terms and finances all of their own customer credit accounts, just as they have for over 100 years. 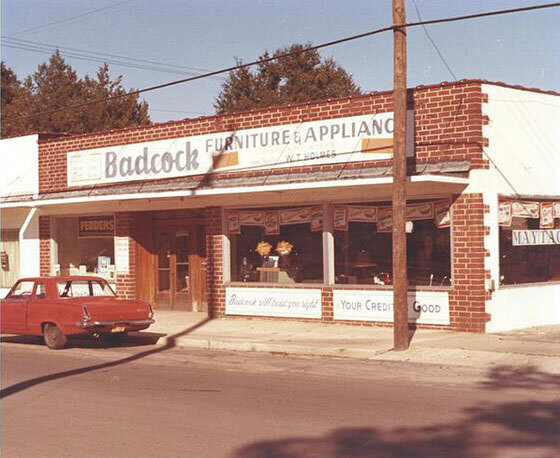 Badcock is driven today, just as it was in 1904, by providing customers with the color and style of home furnishings they want, at prices they love, by friendly sales associates, in an atmosphere that allows them to picture the furniture in their own home. With the company continuing to grow, the future looks bright for the W.S. Badcock Corporation. The introduction of a new “Sales Based Model” of operations is opening doors for new dealers, and Badcock is in the process of converting all stores to the sales based model. Total sales for the corporation are approaching $1 Billion per year, making Badcock one of the largest privately owned furniture retailers in the country. By delivering high quality products, and putting our customers’ needs first, the corporation has established a strong business plan, and a reputation for excellence in customer service, which will continue to fuel future growth and opportunities for the W.S. Badcock Corporation. Today, there are over 350 Badcock &more stores in eight states: Florida, Alabama, Mississippi, Tennessee, North Carolina, South Carolina, Georgia, and Virginia.